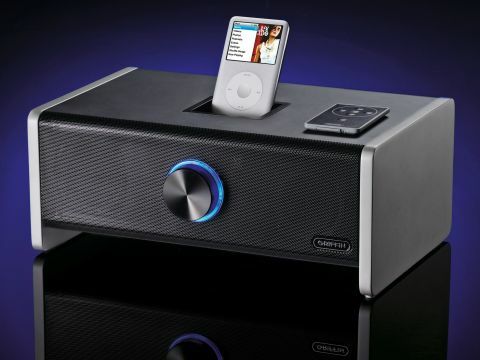 Griffin's Amplifi is a mid-priced iPod speaker system with plenty of volume, is very simple to use and will tuck away on a desktop or table without taking up too much space. Inconveniently, though, the speaker is not meant for use on a shelf, because it has a 5-inch bass speaker positioned underneath the box that directs rumbling vibrations downwards, causing it to lose its sound quality on wobbly surfaces. On a sturdy table the sound tightens up and you get much more out if it. The Amplifi is an amplifier and speaker unit in one box. You don't need to provide anything else except the iPod. It will work with all iPods that have a Universal Dock Connection plus there's a 3.5mm jack for taking a signal from a shuffle or your Mac. Rubber grips to hold various iPods in place come bundled. You also get a remote control, an audio line-in and a single volume control, which when pushed doubles as the on/off button. So you can tell when it's on, the knob is circled by light from a blue LED. Aside from these features there's precious little else going on; it's a very simple stripped down system. Maybe too stripped down for our tastes. We would have liked to see at least a video-out option, so you could run video to a Mac or television, and perhaps a battery bay, too. And because it needs to be permanently plugged into the mains to work, you can forget about taking the Amplifi to the beach to listen to some tunes while you sunbathe. The Amplifi doesn't quite offer the 'room filling' sound experience that Griffin claims, not in comparison to, say, Apple's equally-sized Hi-Fi. It nearly has the volume to compete with the Hi-Fi, but lacks the detail and warmth in the mids to win you over. It sounded progressively better as the surface it was placed on become harder, and in fact sounded best on the solidness of a floor. Anywhere else and you can start to feel the bass reverberate through the furniture at about half volume. The audio profile would suit a student on a budget that happens to be into bass-heavy music but isn't fussed about their coffee cup rumbling along the desk and crashing onto the floor. You can find this speaker online priced anywhere between £80 to £120, which puts it in the same ballpark as affordable iPod speakers such as Altec Lansing's excellent iM9. The sound is much bigger from the Griffin, but it's lighter on features, so it depends what you want out of it.